KUALA LUMPUR (Aug 18): BMW Group Malaysia today unveiled the new BMW X6 M, a second generation all-wheel-drive sports activity coupé (SAC) to its Malaysian customers. According to managing director and chief executive officer Alan Harris, the introduction of the first generation BMW X6 M five years ago contributed to BMW’s success story in terms of dynamic excellence, distinct M design and efficiency. “Today, with its revolutionary design that combines the agility and athletic design of a BMW Coupé with the versatility and seating capabilities of an SAV (sports activity vehicle), and the pure performance capabilities typical of the creations from the BMW M division, the new BMW X6 M will prove BMW’s ability to continue taking its vehicle concepts to an even higher level,” Harris said in a statement. The new BMW X6 M runs a 4.4-litre V8 M TwinPower Turbo engine which delivers 575 horse power (hp), 20hp more than its predecessor, and a 10% increase in torque to 750 Nm. The vehicle carries acceleration power from 0 to 100 km/h in less than 4.2 seconds. Fuel consumption and CO2 emissions has been reduced by more than 20% to 11.1l/100km and 258g/km, respectively. As an M exclusive feature, there is no automatic force-transmitting connection between the engine and the transmission when the vehicle is at standstill. This prevents the vehicle from moving immediately after selecting “drive” and releasing the break, as it will only move with a short tap on the accelerator. The vehicle also includes comprehensive BMW ConnectedDrive features, including the latest generation Navigation System Professional, which benefits from enhanced functionality, better graphics and a 3D map display. 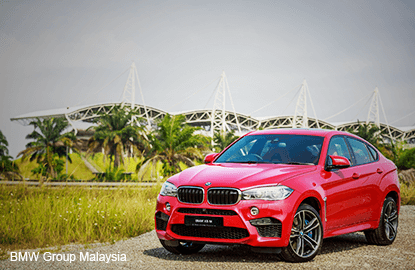 The BMW X6 M comes at an estimated on-the-road price, without insurance, of RM1.239 million. The price tag includes BMW Malaysia’s latest five-year unlimited mileage warranty and free scheduled service programme.